This post is syndicated from Senior Housing News, and was written by Tim Mullaney, an Editor at Aging Media Network. Products like the Amazon Echo have already made their way into senior living settings, allowing residents to hear the dinner menu or get medication reminders simply by asking for them. But voice recognition also holds promise for making clinicians’ lives easier, while enabling senior living companies to cut costs and improve retention. At least, Juniper Communities believes this to be true, based on initial results from a technology pilot with a startup called LexiconAI. Bloomfield, New Jersey-based Juniper operates 22 senior living communities, offering services from independent living to long-term skilled care and post-acute rehab. In mid-September, the organization began testing LexiconAI at its Juniper Village at Brookline location in State College, Pennsylvania. The community is home to about 240 residents and offers the full continuum, from independent living to rehab and skilled care. After being approached earlier this year by LexiconAI CEO Matt Rubashkin, Juniper CEO Lynne Katzmann (pictured above) decided to pilot the product. She believed that the software might help reduce time spent on documentation by letting caregivers dictate their notes rather than type them, she told Senior Housing News. Juniper saw this play out in October, the very first full month that LexiconAI was implemented. Though the trial has been brief and involved just nine clinicians, the numbers have been striking. On average, users have been saving 25 minutes a day on documentation time, according to data gathered by Juniper and LexiconAI. However, this varies quite a bit depending on how much time users were initially spending on documentation—one person was spending more than four hours a day on documentation and now has shaved off more than 30 minutes, Lexicon CEO Matt Rubashkin told SHN. The time savings, coupled with improved documentation, translates to a healthier bottom line. 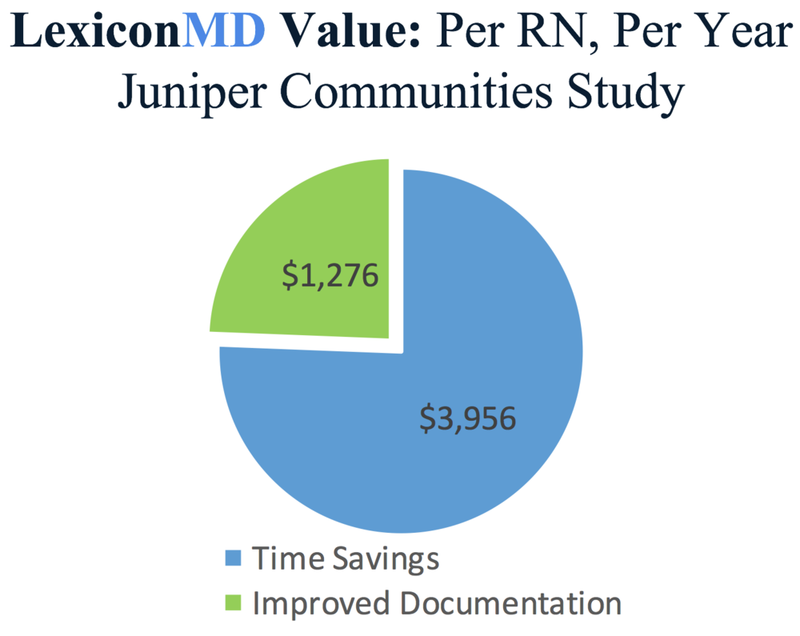 The time savings equates to a value of $3,956 per year per registered nurse using the technology, Juniper and LexiconAI calculated. Rubashkin also worked with Juniper’s national director of wellness to calculate how much additional revenue Juniper would bring in on an annual basis due to improved documentation of care, based on what they’ve seen so far. That came out to $1,200 a year per registered nurse using the technology. Reducing the burden of documentation also has helped Juniper keep clinicians from turning over, according to Katzmann. “Where we were going to lose people, they’re now happy,” she told Senior Housing News.